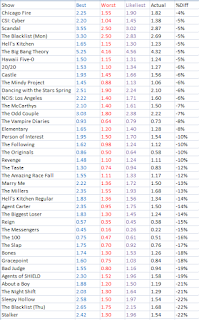 Here's a look back at the highlights and lowlights from the Best Case/Worst Case preview posts, in which I predict the Live+SD 18-49 averages for broadcast series before their premieres. 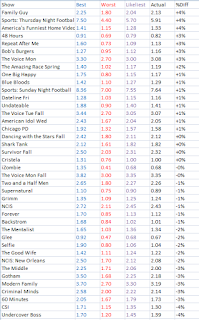 For these averages, I tried to weed out episodes after drastic timeslot moves and (as noted on the individual posts) after the end of the regular season. Let's start with the highlights. 26 picks (19% of the total) were within 2% of the Likeliest. Another 21 were within 5% (35% total), while just over half (70 of 134, 52%) were less than 10% off. Percentage-wise, these are all improved year-to-year. Last year, 15% were within 2%, 30% within 5% and 51% less than 10%. And the numbers were even worse two years ago: 9%/25%/40%. So generally speaking, there's a higher quantity of "good" picks. 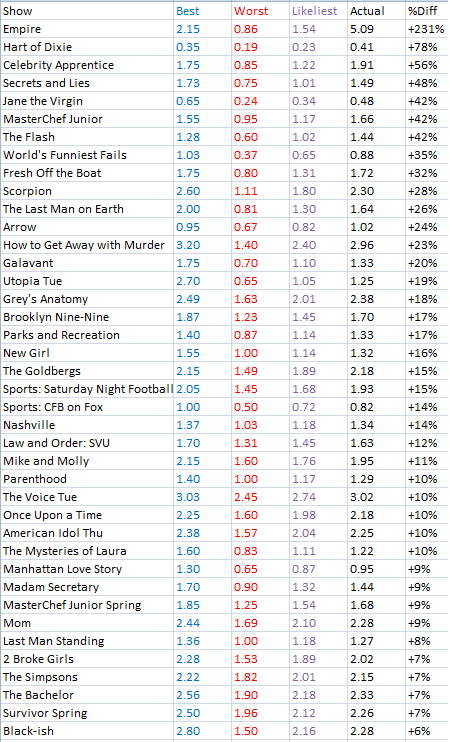 Among the specific highlights: Cristela and iZombie were new shows nailed to the hundredth. Being right about "contrarian" stuff is also good, so I will mention that everyone thought I was too pessimistic on Selfie and I seem to recall most people being more down on the Undateable/One Big Happy duo than I was. In the returnee column, Glee sticks out as a pretty good pick given all the huge factors in play (final season, move to Friday, massive downward momentum), and I had a slew of oddly accurate picks for reality staples (especially in the fall). 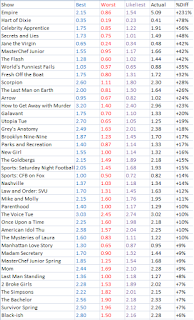 This year was actually kinda light on hugely negative misses, and practically all the big misses to the negative were new shows. Quite a few of these (including four of the top five) fall into the "LOL NBC" category. I'm still pretty stunned that Allegiance was that DOA after what seemed like a good lead-in, but probably should've been adjusting more for the ridiculous weakness of the NBC class by the time Odyssey rolled around. The one that really bothers me here is Mulaney, because most people were correctly much more down on this show than I was. I acknowledged that it was a bad fit but I'm still just shocked that it was so soundly rejected from day one, and perhaps even moreso now that the network has had multiple live-action shows that fit in pretty well with the Sunday block. It is striking that the incompatibility was that much of a factor right out of the gate. I really underestimated a lot of new shows this year. Empire is by far the biggest miss I have ever had, though it would've been pretty difficult to predict much higher than this and really difficult to get anywhere close to the actual 5.09 average. With a couple of these I can take some solace in being wrong about only part of the story. Secrets and Lies premiered almost exactly where I expected, it just held up exceptionally well for this kind of show. And Galavant was a show that ended up where I expected, but just premiered a lot better due to the very favorable conditions on that opening Sunday of the year. However, there were several shows like Jane the Virgin, Fresh Off the Boat and Scorpion that I simply underestimated to an annoyingly huge degree from start to finish. Jane seemed wildly incompatible with its whole network, Fresh Off the Boat self-starting was too daunting a task, and Scorpion just seemed like another middling CBS procedural. Shrug. I'm not as bothered by stuff like The Flash and How to Get Away with Murder (which I pegged as very big and just don't see how I could've gone that big) or The Last Man on Earth (where I actually had a much higher prediction than many commenters). Hart of Dixie was another situation like Sleepy Hollow last year where a big part of the miss was an unanticipated timeslot situation. 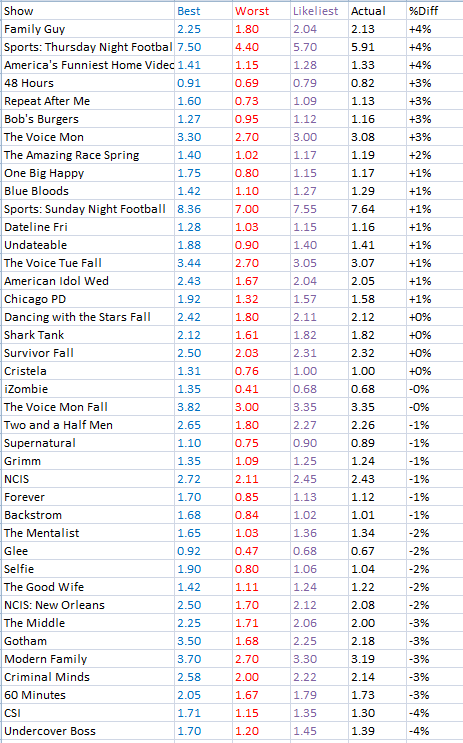 I just went with the average I predicted, but I think I would've gone closer to 0.30 if I'd known it would be at 8/7c after local programming. 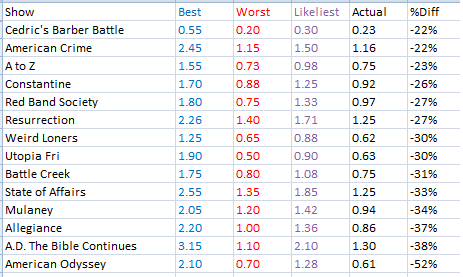 But I didn't feel comfortable omitting it entirely from the record since even 0.30 would've been a nearly +40% miss. The other two returnees that are in truly awful territory are Celebrity Apprentice and MasterChef Junior. I'm still pretty dumbfounded by Apprentice, a show that was tanking and then returned from a year off to a series high Plus. But I could've accounted a little more for a better position on the calendar, early in the winter vs. Sundays in the spring in previous years. The MasterChef one feels more like a genuine mistake since I should've been kinder to a show moving from Friday to a weeknight. But it was a prediction made at the depth of the Fox meltdown when Utopia was getting 0.8's, so it was tough to muster up optimism. Nothing else irks me too much. 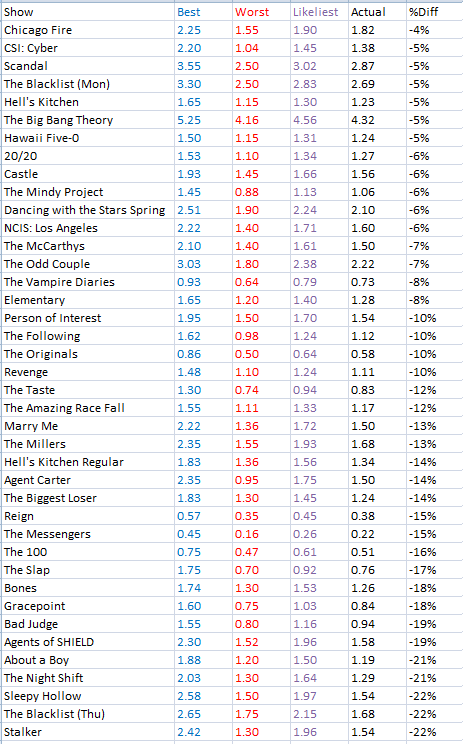 I mean, Resurrection and Sleepy Hollow were both shows that I predicted to average at least a couple tenths below their series lows at the time, so it's not like I was being all that optimistic. 72 of 134 "Likeliest" picks this season were low (54%), which is significantly less than the 70% and 66% in previous seasons. 58 were too high (43%), and four (3%) were nailed to the hundredth. The median miss size (in other words, halfway down the list of absolute value of %Diff, a measurement of how much I missed by) was 9.7%. That's slightly worse than 9.3% last year. The average miss was 14.9%, which is actually worse than both of the last two years (13.3% in 2013-14 and 14.4% in 2012-13). However, this stat is much more inflated by enormous misses than the median stats; just removing Empire would put it at 13.2%. The median miss (in other words, halfway down a list of %Diffs from +117% to -48%) was -1%, much closer to even than -5% or 2013's -9%. So the optimism/pessimism balance was almost perfectly calibrated. One area of noticeable improvement this year was the "worse than worst case" and "better than best case" misses. 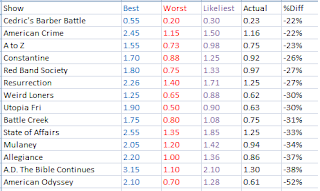 Only 13 picks (10%) were worse than the worst case, while only 7 (5%) were better than the best. Last year, 18% were worse than worst and 4% better than best. In 2012-13, a ridiculous 35% were worse than worst! And as usual, quite a few of these just barely missed falling inside the range. So if nothing else, we are at least getting better at imagining the possibilities. Overall, the story here seemed to be that there were both more "good" picks and more "bad" picks this year. Looking at the median stats, the badness of the bad slightly outweighed the goodness of the good. I seem to be getting better at the relatively reliable/predictable stuff, but the new classes are becoming tougher to peg. The two areas of consistent failure were underestimating the new class and overestimating NBC. If the 2015-16 new class has another half dozen or more hits, I'm probably gonna fall victim to the first problem again. There hadn't been a class as good as 2014-15 in a decade and in general, I don't really regret erring on the side of caution with most of those shows. Maybe the primetime audience is becoming more fickle and plentiful new hits will be the norm going forward. For now, I still think restraint will be the better long-term strategy. We'll see! For the completists, below are four images with a complete record.